Liz Robb, "Large Indigo Coil," 2014, cotton, indigo, 150 x 18"
Avant-garde art aficionados of a certain (i.e., advanced) age will remember when the soft sculpture of Claes Oldenburg was the newest outrage against the cultural norm of traditional art materials. A decade later, women’s craft techniques and feminist criticism invaded male bastions of culture. Nowadays, sewn sculpture is no longer seen as a challenge to aesthetic gravitas or paternalistic authority, so Liz Robb’s new work in fiber, aligned with a postminimalist interest in process, can be rightly appreciated on its own terms. Robb: “I work sculpturally to capture a moment in time using active processes that become meditations: indigo dyeing, weaving, wrapping, compressing, structuring, ordering, and releasing…. 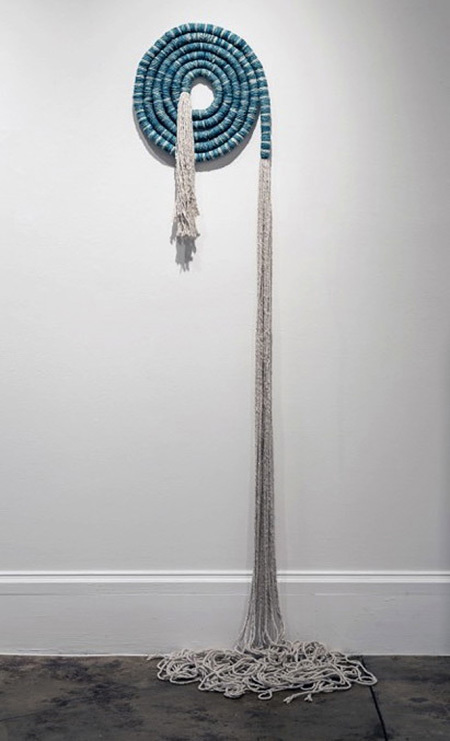 I utilize the power of the materials to construct architectural frames from which to build weighted objects in space.” “Large Indigo Coil” is a wall-hung spiral of braided fiber with ‘jets’ of cotton spraying from its ends, suggestive of marine invertebrates. “Nine Circles” transposes the Johnsian idea of repeated simple elements with variations in treatment, suggesting a typology or even — if you see the objects as transformations — a narrative. “Sunset,” with its knotted white valance and braided beige curtain separated by a thin band of orange, combines concealment and revelation, the unseen and the seen.